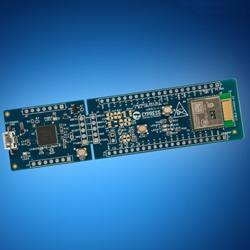 The PSoC 6 BLE Prototyping Kit from Cypress Semiconductor is now in stock at Mouser. Providing simple access to up to 36 GPIOs, the low-cost, breadboard-compatible kit gives a turnkey solution that connects Bluetooth low energy 5.0 connectivity to IoT applications and smart home products, white goods, wearables, and industrial IoT devices. The kit comprises a fully certified CYBLE-416045-02 EZ-BLE Creator module based on a low-power, high-performance PSoC 63 microcontroller. The module features 1MB of application flash, along with 32KB EEPROM area, and 32KB of secure flash plus a royalty-free Bluetooth LE stack compatible with Bluetooth 5.0. The kit offers simple access to 36 GPIOs and the programmable digital and analog peripherals provided with the module. The kit also incorporates current-measuring jumpers, a push button, and two LEDs. The kit highlights a KitProg2 onboard programmer and debugger with a perforated snap-away design, enabling engineers to use the module separately from the target board. The board also includes a MikroElektronika mikroBUS interface for use with MikroElektronika Click boards, which enable expanded functionality without extra hardware configuration.